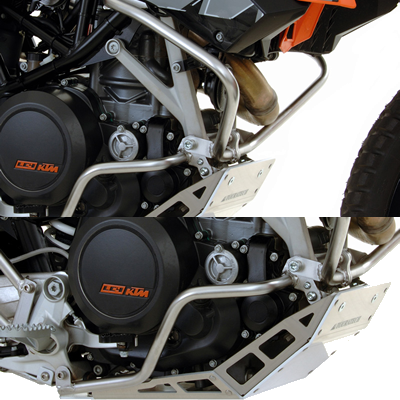 Need some extra protection for your KTM 690 Enduro or 690 SMC? Take a look at the new crash bars available to you. The Upper Crash Bars will protect the upper portion of your engine including the valuable radiator. The Lower Crash Bars are a nice compliment to the upper bars in that they will protect the rest of the engine in the event of a side impact with the ground. Pick up yours now before they are out of stock! KTMTwins.com is now a Aqualine/Safari Dealer!